The Ode to Freedom is regarded as the longest national anthem. 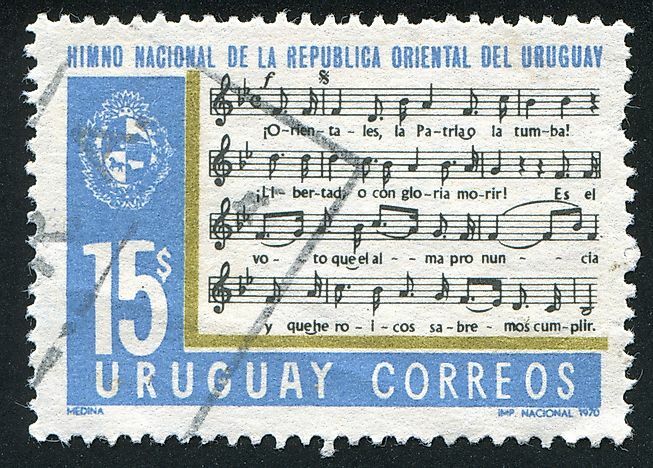 A stamp printing in Uruguay showing a section of the national anthem. Editorial credit: rook76 / Shutterstock.com. A national anthem is a song usually sang during special occasions and recognized by the country’s people and the government as the song they identify with. National anthems may sometimes be a prayer for the country or a chronicle of the country’s history. In most cases, national anthems are written in the country’s official language and in case a country has more than one official language the anthem may be written in all the official languages. In such situations, the anthems may not necessarily be a translation of each other. Anthems usually arouse great feelings of patriotism in the citizens when sang and are usually symbols of the national identity. In 1823 Dionysios Solomos, drawing inspiration from the Greek War of Independence, composed the poem the Hymn to Liberty consisting of 158 verses making it the longest national anthem in the world by lyrics. The poem chronicled the suffering that the Greek people underwent during Ottoman rule and their thirst for liberty. Nikolaos Mantzaros composed the music to go with the poem in 1865. Due to the length of the poem, the Greek government adopted the first two stanzas as the country’s official anthem in 1865. On November 16, 1966, Cyprus adopted the Greek national anthem as their own after inter-community violence had rocked the country. During the official closing ceremony of every Olympic Games, the Greek national anthem is played to pay homage to Greece where the Olympic Games originated. Composed by Francisco Acuna de Figueroa in 1833 the National Anthem of Uruguay has a 150 bars of music. Since the Greek government adopted the shorter version of their anthem, the Uruguayan national anthem became the longest national anthem regarding how long it takes to be sung at around six minutes. On July 8, 1833, the Uruguay national government officially decided that the lyrics written by Francisco Acuna would be the lyrics to the country’s national anthem. Francisco Jose Debali and Fernando Quijano worked together to come up with the music for the lyrics which was officially accepted on July 25, 1848. Francisco Acuna also wrote the words to the national anthem of Paraguay. Japan’s national anthem has the distinction of being not only one of the world’s shortest national anthems but also having some of the oldest lyrics in history. The words to the anthem were from a poem composed sometime between 794 and 1185 AD by an unknown author. The music that go with the words, however, is more recent as it was selected in 1880. The Japanese national anthem is one of the most controversial national anthems with over four hundred teachers being punished for refusing to honor the anthem. A large majority of the younger generation of Japanese fail to see the importance of the anthem since it is written in an archaic language that they do not understand.